No matter how much we simplify our lives, try to be organized, or carefully plan our weeks, stress happens. And in a hyper-connected world, stress can find us wherever we are. With a reach like that, we could all use a few new strategies for maintaining a level head when the world feels upside down. 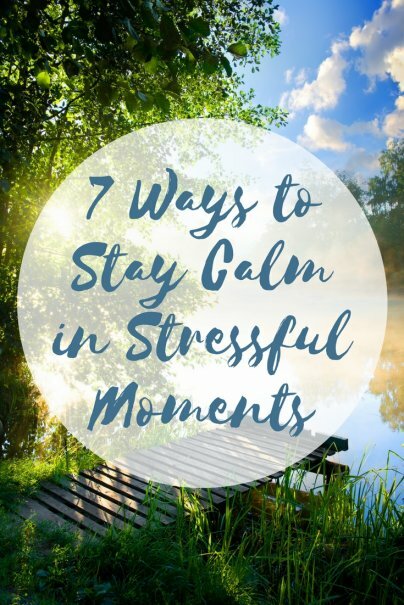 Here are seven ways to stay calm when you're stressed. If you can anticipate stress, you can prepare for it and (with a little practice) control your response to it. Approach the situation with a positive attitude, consider what solutions will be available, make a plan, and determine how you'll reward yourself once the challenge is over. With a strategy in place, you'll be much more likely to stay cool when the heat is on. Without proper perspective, stress can seem all-consuming. When you feel the pressure mounting, remind yourself that this is just a challenging moment in time; it's not the rest of your life. Identify the natural end point of every stressful period — the end of workweek, once final exams are over, or as soon as the latest project is complete — then work toward that point with renewed clarity and energy. Every stressful situation is different. Focus your energy by understanding what's within your control right now and working through solutions. Surrender everything that's beyond your control to the talents of others and that ultimate de-stressor: time. With a clearer idea of what you can control, prioritize tasks as you go. Ask yourself, "What issue is most urgent? What could have the largest impact on my job, my business, or my family?" Sure, the printer may be jammed, there are deliveries to sign for, and your best salesperson just handed in her resignation letter. But if your largest client is fuming on the other end of the phone, that's the emergency. Focus only on what's primary and leave the rest for later. Writer featured on Time, Inc, Christian Science Monitor, and HuffPo.